Engineered with a secure corner to corner diagonal brace, the AeroTab keeps a tablet’s screen, as well as all buttons, cameras, speakers and ports open and accessible. AeroTab comes in two sizes, Small and Large with either the 2 Mount or 4 Mount Bracket option. Both options allow you to connect a tablet to stands, arms, clamps or grips. Attach it anywhere. To determine your correct AeroTab size, use the size calculator below. All iPads will use the AeroTab Small, except the iPad Pro 12.9″ will use the AeroTab Large. The Hitch D-Ring simply screws into the Connect Lite bracket or any female 1/4"-20 thread and allows users to attach a camera strap to keep their device handy and accessible at all times. AeroTab Universal Tablet System is designed for a tight fit on the corners of any size tablet. The tablet can be rotated and mounted in portrait or landscape orientation. Once the tablet is placed in the diagonal extension, slide the non-slip, polyvinyl-coated padded corners on the tablet to ensure a tight fit. Using the circular bracket on the back, tighten the mount so the diagonal slide is locked in place and the tablet is securely resting in the AeroTab. Then simply attach the AeroTab bracket to the tripod, stand or arm of choice and lock down for a secure mount. Shoot, play, view, read, edit. Do whatever it is you love to do with your tablet. The collapsing design makes travel compact, easy and portable. Whether the AeroTab is left on the tablet or packed in a bag, it takes up little space in a travel case or bag. Already have a protective case on your tablet? The AeroTab works with most existing protective enclosures as long as the dimensions fall within the ranges below. To determine the right version AeroTab for your tablet, measure the tablet’s diagonal length from corner to corner and measure its thickness to confirm compatibility. If keeping your tablet in a case when mounting, be sure to measure it with the case on. If you have the tablet length and width use our diagonal calculator to determine the ideal fit. AeroTab Large holds tablets ranging in physical corner-to-corner diagonal length from 13.5″(34.3cm) to 20″(51cm) and accommodates tablets up to 0.82″(2cm) in thickness. AeroTab Small design holds tablets ranging in physical corner-to-corner diagonal length from 8.75″(22.2cm) to 13.25″(33.66cm) and accommodates tablets up to 0.70″(1.78cm) in thickness. Calculate the diagonal measurement of your tablet. Use the same unit of measure for all fields. The AeroTab 2 mount option is designed to mount to any 1/4″-20 tripod and Arca-style ball head. The AeroTab 2 mount option features all the versatile functionality of Tether Tools LoPro-2 ProBracket and will mount to any lightstand, Master Clamp, Arm or Elbow and more. The AeroTab 4 mount option includes the mounting options of the 2 mount (LoPro-2) and includes a 5/8″(16mm) Baby Stud and 3/8″ thread. The AeroTab 4 mount option features all the versatile functionality of Tether Tools LAJO-4 Pro Bracket. An additional 1/4″-20 receptor on the back of the AeroTab allows you to attach a camera sling strap or belt clip designed for cameras or it can be used to add a light, microphone, recorder, receiver or more to any set up. In this setup, the Case Air is being powered by a Rock Solid External Battery Pack while in use thanks to the Case Air Power Split Cable. The battery is mounted to the tripod using a StrapMoore and is protected by an orange Rock Solid External Battery Pack Protective Sleeve. The iPad is mounted on an AeroTab Universal Tablet Mount held in place by the Rock Solid Master Articulating Arm and connected to the tripod with a Rock Solid Master Clamp. In this setup, the Rock Solid EasyGrip ST is holding an iPad mounted in an AeroTab Universal Tablet Mount to the Rock Solid Low Boy Roller. 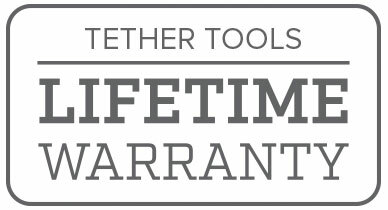 AeroTabs are made in the USA with the finest materials and come with Tether Tools’ Lifetime Warranty.